I had been very much looking forward to reading this book, but unfortunately it has been quite a disappointment. The first hundred pages, about the childhood and teen years of Eileen Tumulty, fly by and are quite promising. But something curious happens as she becomes an adult, gets married, has a kid, and begins to struggle with the way her childhood dreams have turned out: the novel loses all momentum. Seriously, loses all momentum and becomes a tedious slog. I don’t even really know how it happened, but unfortunately it did big time. For one thing, after she gets married the focus slowly shifts away from Eileen and onto her husband, Ed Leary, and the shift just doesn’t take. 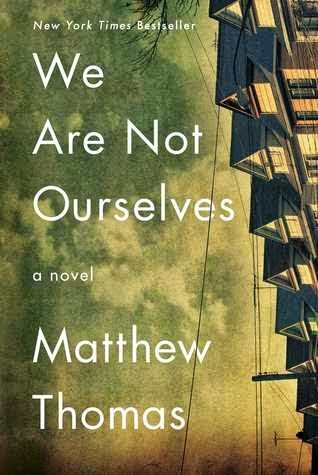 We spent so much time getting invested in Eileen’s story, and author Matthew Thomas seems to take it for granted that he can just expect the same allegiance for her husband. For another thing, Eileen’s character loses her defining characteristic: her drive. And that makes her less interesting, too. It’s a shame. The end result is a rambling, overly long novel that doesn’t really have any focus or characters you can rely on. Getting through the 600 page length takes far more work than it should, and that really is a shame because for a brief shining moment, We Are Not Ourselves really seemed to be going somewhere.